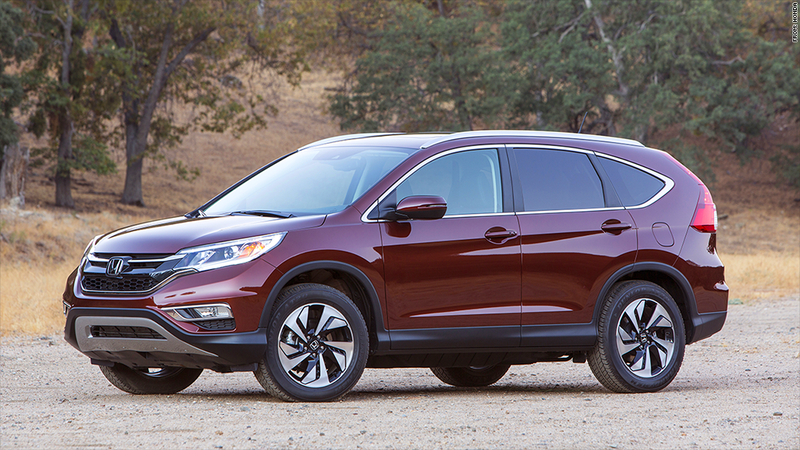 Honda's CR-V is the Motor Trend SUV of the Year for 2015. Motor Trend magazine has named the revamped 2015 Honda CR-V its SUV of the year, beating out 18 other all-new or redesigned SUVs. The CR-V wasn't completely redesigned for 2015. But Honda (HMC) made significant improvements that put it over the top, Motor Trend editor-in-chief Ed Loh said. Among the most striking, he said, was a continuously variable transmission that replaced the CR-V's 5-speed transmission. As its name implies, a continuously variable transmission can vary gear ratios up and down, unlike other transmissions with a finite number of fixed-gear ratios depending on the vehicle's speed and how much pulling power is needed. With the new transmission and other changes, the 2015 CR-V gets three miles per gallon better fuel economy than the 2014 model. Loh also said it feels more dynamic to drive -- a departure from the previous model, which had been "kind of boring." "They fixed all that and gave it a really nice suite of safety features, including a lane keeping assistance system that is pretty amazing," he said. The CR-V's lane-keeping assistance feature uses cameras to monitor the vehicle's position while driving, as other such systems do. But it can also briefly steer the vehicle on its own. It even allows drivers to take their hands off the wheel for as long as 12 seconds. Motor Trend's 2015 SUV of the Year award was open to any SUV sold in the United States that was all new or substantially redesigned for the 2015 model year. Among the other contenders were the Porsche Macan, Ford (F)'s Lincoln MKC, the BMW X4 and X5, and General Motors (GM)' new full-sized SUVs including the Chevrolet Tahoe, GMC Yukon and Cadillac Escalade. Chrysler Group (FCAU)'s new Jeep Cherokee was included because last year it was released just slightly too late to be included in the competition. It nearly beat the CR-V, Loh said, but was held back by its 9-speed transmission. "Its performance was a letdown for us," he said. The magazine tests the SUVs together in paved and dirt road conditions, as well as on a test track. The magazine's writers and editors then select a winner based on six criteria: design advancement, engineering excellence, performance of intended function, efficiency, safety and value. Last year's SUV of the Year award was given to the Subaru Forester. The magazine gives out similar awards later in the year for Car of the Year and Truck of the Year.